“Stronger”-“Faster” Are they the most overused words in Karate? are two of the most overused words in Karate and usually without a correct understanding of the meaning behind the words. These overused soundbites are n’t usually used in the correct context and lead to many of us developing bad habits. So if we look at what they should really mean. What this should really mean is to accelerate the technique more. Speed of the technique at impact point is one (note that I say one *) of the reasons why a technique can be effective and will cause damage. So going faster is generally a good idea, but please remember, it is all about the acceleration of that technique to a maximum speed at it’s impact point without any deceleration. * At a more senior level, other skills are developed which mean that speed is n’t quite as important. Timing and the way the technique is performed become just as useful tools. Now this is the tough one to look at. We are often told to “use more Kime” or to make the techniques as “Strong” as we can. In reality we should be told to relax more not to make a technique stronger. Often the result of being told stronger / more kime is to make the Karate-ka contort and contract the muscles of the body in all sort of funny shapes in an effort to be strong. All this usually achieves is that the Karate-ka tenses all of their body muscles to take on the western ideals of strength and once this is done, any pretence of speed is lost. Ever tried to walk or even run whilst tensing your muscles? Not easy is it, unless you are happy looking like a robot. Many instructors translation kime to their students as tension. This is not strictly correct, its really focus at the end of the technique. Now if you buy into the idea that Kime is necessary to make a techniques effective (and I don’t by the way + ) then what you have to achieve or at least initially, for newer students, aim to achieve, is that the technique and whole body is totally relaxed and fluid right until the moment of impact. Then for a micro second, you focus (tense) the whole body but immediately you have to go back to that state of relaxation. If this is done correctly, it also helps the practitioner with the flow and speed of transition between techniques. The most common mistake being made here is that people are too tense for too long, its really not necessary and if you keep doing this you’ll never make it as a competent Karate-ka. In order to be a competent Karate-ka you must flow between each and every technique, but each and every technique must be effective. Look at some of the Youtube videos of the likes of Asai or Kanazawa, they look and are smooth. A dancer understands this and can make their techniques flow, look at someone doing Tai Chi, they understand this concept, many Karate-ka (exponents of Karate) who have yet to ‘get there’ look at Tai Chi and see something performed slowly and without power and assume that that this means its only for health and is no good for self defence. Nothing could be further from the truth and I’d go as far to say that martial Tai Chi (ie Tai Chi not taught by some new age hippie type on a health trip) is a very good martial art both in terms of the principles it teaches and also the moves you learn. Many Karate-ka would benefit hugely from practising it. 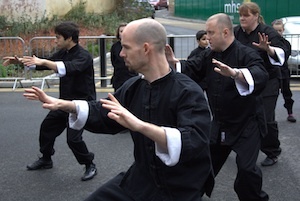 I’d also go as far to say that Tai Chi is harder to learn and practise than Karate, due to the softness required. So to summarise the main messages here. Relaxation is key, from relaxation stems speed and power. If Tai Chi was easy it would be called Karate ;-). You may not practise Martial Tai Chi, but all the principles in Tai Chi exist in Karate, if its taught and practised well. Karate and Tai Chi are the same fundamentally in what they teach. The biggest difference is that in many schools Karate always is ‘stronger and faster.’ You could say that Tai Chi is the thinking persons martial art as students are training to think for themselves and to be always mindful of what they are doing and how they are doing it. Why not try some Karate kata at ‘Tai Chi speed’ or do some pushing hands to learn to be more relaxed. + I mentioned that I don’t buy into Kime being necessary for effective techniques. What Kime actually does is to stop the flow of a movement right at the moment of impact. It’s a bit of a contradiction don’t you think being told that you have to accelerate faster but then just as you hit the target you have to slow the technique down by using Kime? I know, I’d finished the article but could n’t resist the final curve ball 😎 Have a look at this clip of boxing knockouts. Is there much use of Kime within it? On the wall in our martial arts centre in Basingstoke facing the students when they train is a list of 8 words, these 8 words represent the 8 principles that we need to fully understand to make our Martial Arts work. The first of these words is ‘Feet’. Our feet is our contact to the ground that we stand on and the pressure of our feet to the floor is what gives us the power and energy to stand upright and move around. Most people usually do this mindlessly not realising that the skill as a Martial Artist starts at this point. Each part of the foot can engage a myofascial chain up the leg, which in turn engages the body core to power the torso and arms through to the hands. To engage the feet properly we must first stop balancing the body on the skeleton and suspend most of the body weight into the ‘body suit’ of myofascia. To do this we have to soften and connect the body core from the head down to the feet and enhance this by disengaging the joints upwards. As we then gently spiral in the feet we can feel the myofascial chains connecting upwards. The balls of the feet engage up through the front of the thighs, the outer edges the sides of the legs, the heels the backs of the legs and the insides of the feet up the insides of the legs. All of these connect into the large muscles of the deep waist and around the spine Which can be manipulated in a highly complex and variable manner to add power up into the chest, upper back and shoulders and out through the arms to the hands. On contact with the opponent the hands work in exactly the same manner back down to the feet. The thumb side of the hands connect through the chest, the little finger side through the back, the heel of the hand through the underside and the upper or ‘ball’ of the hand through the forearm, the disengaging and opening of the shoulder, elbow and wrist joints and spiralling motion out through the hands whether balled or open, connects to the spiralling in the feet through the body core and legs. The arches of the feet will pump energy as you soften, loosen and pulse from the feet, the spiralling action of the feet will bow the legs, opening the hip joints, lengthening and opening the spine, sending energy to the joining of the bowing of the lower and upper back and neck to enhance this flow out through the bowing of the chest, back and arms to the cupping in the palms of the hands. In this way we are connecting, rooting, stabilising and empowering the entire body from extremity to extremity. The harmony and manipulation of upper and lower body feed each other to multiply power and animation.